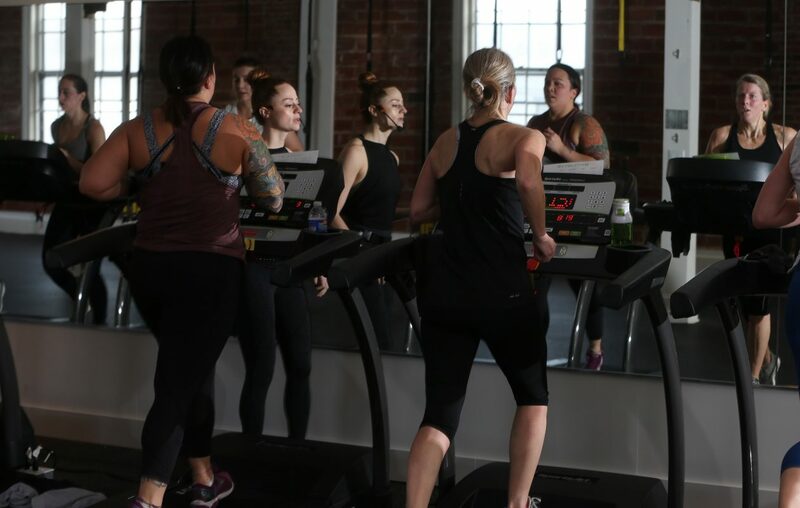 The trio of fitness trainers who opened Revolution Indoor Cycling four years ago have always been clear on the benefits of the cardio workout that remains in their wheelhouse. The owners decided two years ago to ramp up the Revolution experience. Planning and construction is finished and the staff of 20 will show off an expanded studio next weekend that includes a strength-training-focused second floor and the latest Healthy Scratch café, the third installment of a concept launched in October 2016 inside the Shops at HarborCenter by Kelly and Jessie Pegula, daughters of Buffalo Bills and Sabres owners Terry and Kim Pegula. "We're now like a one-stop wellness center," McCrone said. Revolution owners reached out to Pegula Sports & Entertainment last fall to ask if the Pegula daughters would like to set up in the center to provide clients and the public with smoothies, fresh-pressed juices, grab-and-go snacks and meals, and food bowls. The company saw success with food truck stops and during special events at the cycling studio, so accepted the offer. 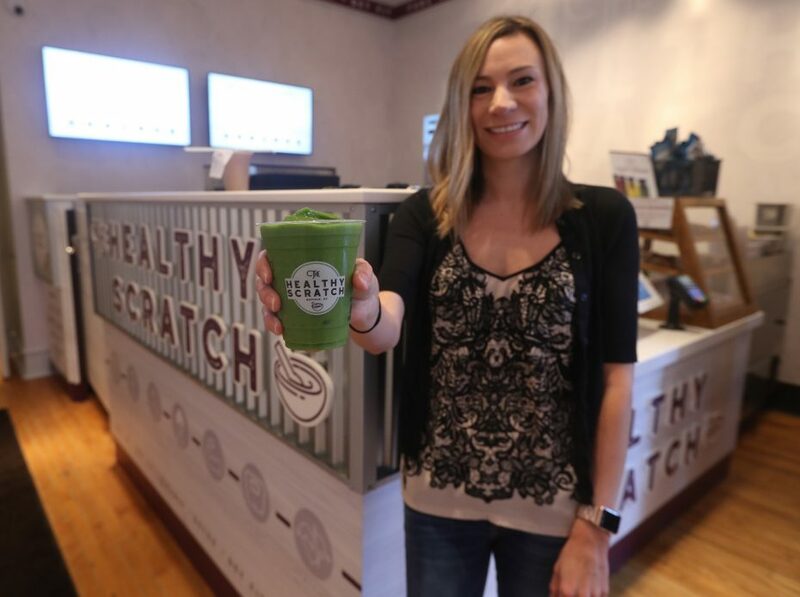 "The basis of our brand from the start was to grow our wellness categories – which include energy, recovery and wellness – and incorporate it with people who use them the most," said Kristina O’Connor, Healthy Scratch general manager. The HarborCenter location got a bump in business a year ago after Impact Sports Performance – which runs a strength training studio above it – added a cycling and yoga studio next door to the café. That boosted confidence, too, O’Connor said. Healthy Scratch is open from 8 a.m. to 6 p.m. Monday through Saturday and 9 a.m. to 4 p.m. Sunday in HarborCenter but will tailor its hours at Revolution to busy class times. The plan at this point is to generally operate from 5:30 to 8:30 a.m. and 4 to 8:30 p.m. Adjusting to the audience is part of the young franchise’s business plan. It opened its second café in March 2018 in the Scott Bieler Clinical Sciences Center at Roswell Park Comprehensive Cancer Center; hours there are 8 a.m. to 3 p.m. weekdays. The company will open a fourth location next month in the Buffalo General Medical Center lobby, near a Tim Hortons. The two most-popular items in the franchise are Everyone's Talking About It, a peanut butter and banana-based smoothie also made with strawberry purée, fresh-pressed apple juice and unsweetened almond milk; and Can't be Sure, a green smoothie with mango, avocado, pineapple, spinach and apple juice. Revolution Cycling has lured a growing number of clients since moving from an old carriage house in early 2015 and opening in a former Canisius College-owned building along Main Street in the city's Cold Springs neighborhood, between the college and the Buffalo Niagara Medical Campus. Clients once took classes in the first-floor cycling studio and a cramped nearby TRX resistance band studio. Forty Lemond bikes often are full for classes in the cycling studio, which remains the same. The second floor now contains 17 pairs of TRX bands, 11 rowing machines and nine treadmills, which can be used separately or for cross-training. The treadmills will be used in part for run training classes. A private personal training space (which includes its own bathroom and shower), as well as free weights, kettlebells, Bosu balls and other fitness equipment, add to the options. Locker rooms for men and women – which include one and two showers, respectively – will make it more convenient for clients to take a class and clean up afterward. Some clients from the suburbs who drove in for classes drove home to shower and then back downtown for work are especially thrilled with the upgrades, Meyers said. "On the weekends,” she said, “they make the studio a destination. They'll come from East Aurora to cycle and then get brunch." The Healthy Scratch has added online ordering to streamline the process for those who want a quick meal or energy boost when time is at a premium. “We are expanding that to our other locations as well,” O’Connor said. “You can go to our website (thehealthyscratch.com) under ‘Locations.’"
The Revolution expansion – along with a $25,000 Ignite Buffalo grant from 43North and Facebook – allowed Revolution to hire and cover part of the salary for its first full-time manager, Kathleen Granchelli, who also runs the Lululemon Buffalo Run Club. Free classes: Cycle classes at 8:15, 9, 9:45, 10:30 and 11 a.m., as well as noon; 8 a.m. Rev Run; 8:40 a.m. TRX; 9:20 and 10 a.m. RevShred; 11:20 a.m. Kettlebell; noon RevRow + Strength; and 12:40 p.m. Run + Strength (anyone may preregister starting today at revolutionbuffalo.com/schedule); 9 a.m. pop-up Lululemon Run Club (no registration required).